It often feels like Mr. Narwhal and I share the same brain. While we have our own interests, we do have a lot of things in common, and often find ourselves saying things like "I was just thinking that!" or writing the same answers when playing games. One of the things about Mr. Narwhal and I that we don't share in common? Our sentiments on planning ahead. He has a go with the flow attitude about life, and I like to make lists, spend money on Erin Condren planners and yes, create a secret wedding Pinterest account three months after we started dating. I like to plan things*. I just do. I have in fact been planning my wedding since I can remember. I was made for this stage of my life. While I did heavily consider the idea of eloping for quite some time (more on that another day), a lot of my excitement leading up to engagement and wedding planning was the planning part. While Mr. Narwhal has his go with the flow attitude, over the past two and half years, I have infused a bit of a plan-ahead attitude in him and he has been the best sidekick in our wedding planning journey. By the time we were engaged, I already had a lot of pre-planning done and figured out and it was like green-light-go to jump on board to all of the things I had been filing in the back of my brain (and secret Pinterest account/folders) for months. Okay years. This pre-planning time of my life was extremely helpful to hit the ground running when it came time to actually get going. I had a lot of my research completed, and it was just a matter of securing things. This is why less than a week after we were engaged we had a location, date set, a photographer meet and greet scheduled and a potential band in the works. So to all of my waiting friends feeling slightly guilty by the amount of pre-planning you have completed, let me tell you... you'll thank yourself later! Were you a pre-engagement planner? 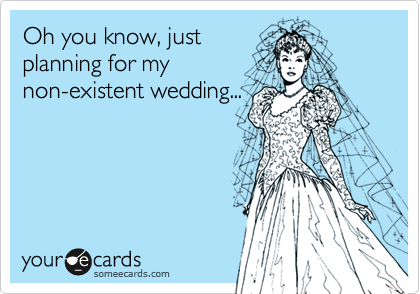 Do you enjoy the actual wedding planning part? *I must note that this obsession with planning doesn't always translate into the best organization skills, but I do try my best. I'm more so a seasonal organizer versus a constantly organized. Don't look at my email inbox.